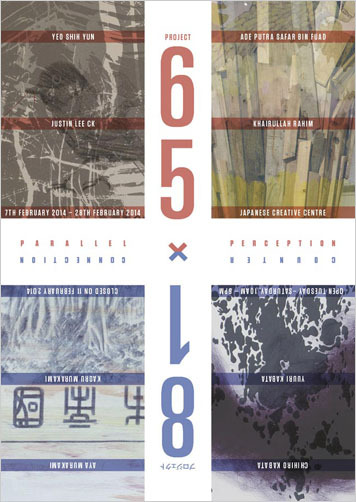 I am participating in a group exhibition PROJECT 6581: Parallel Perception & Counter Connection at JCC – Japan Creative Centre in Singapore. A group exhibition by four Singapore artists and four Japanese artists. Please drop around if you are passing by. PROJECT 6581 is a collaboration of INSTINC Singapore and Youkobo Art Space Tokyo. Gaining its name from the phone codes of Japan and Singapore this project involves the exchange of 4 artists from each country in a collaborative residence program. Each pair of artists immersed themselves in the city for a period of one month and created works inspired by the city. In this series of art residency exchanges, two pairs of Singaporean artists and two pairs of Japanese artists switch cities and explored art in a culturally displaced frame of mind, as they try to find a parallel in space and time of where they came from and where they were situated. The attempt to negotiate the differences of geography that result in differences in ways of life and ways of thinking in the two different countries give rise to a series of artworks that revealed a reconciliation or a resolution of the issues explored and exposed.